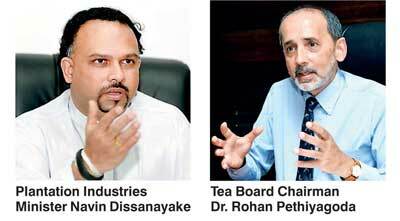 Plantation Industries Minister Navin Dissanayake yesterday sought to calm a panicked tea industry, firing off a letter to President Maithripala Sirisena to forestall a prohibition of tea imports for blending and reassuring he would do his utmost to keep policy unchanged. Top tea companies became alarmed after President Maithripala Sirisena during an election rally on 28 January said he would ban imports of tea for blending, claiming it was promoting sale of substandard tea. He had also stated the same ban would be imposed on pepper imports, but this was hailed by the relevant industry as positive. “I’m apprising the President of the true facts regarding tea imports to Sri Lanka. Only about 8 million kilos of tea is imported and this is done under strict regulation by the Tea Board. Under no circumstances is this imported tea substandard or released to the local market. I believe the President has not been given correction information,” he said. The issue is unlikely to come up at the Cabinet meeting today, the Minister said, but assured if it does he would inform the Cabinet members of the true situation of blending within Sri Lanka. Sri Lanka produces about 300 million kilos of tea each year and earns about $ 1.5 billion in exports. Refuse tea or substandard tea makes up only about 5% of the overall production and is usually made up of ‘sweepings’ that are dyed and added to good tea by unscrupulous elements and then sold. Even though the amount of imported tea is comparatively minimal, it is critical to Sri Lanka’s value-added tea industry, which accounts for about 30% of foreign revenue and is one of its biggest growth segments. Tea Board Chairman Rohan Pethiyagoda acknowledged the industry was extremely concerned by the President’s statement and noted it would be a “disaster” if the ban is implemented. “I did not see this, but I did hear such a thing. I know politicians are apt to say silly things in the heat of an election campaign, but I would be astonished if any President of Sri Lanka actually did make such a thoughtless and foolish statement. If it is true, it would be a disaster for the tea industry. The story has already caused panic. How can exporters prepare shipments, source their produce, generate their packaging and so on if such a ban is looming? When policy changes are needed, government needs to generate policy in consultation with industry, not on the whims of politicians desperate to win a vote or two,” he said. Touching on the repercussions of the previously implemented glyphosate ban, which was done without expert or stakeholder consultation, Pethiyagoda insisted that policy making needs to be more consultative, transparent and predictable. The industry has calculated a Rs. 15 billion to Rs. 20 billion loss of revenue due to the glyphosate ban and is battling toxicity issues caused by alternatives used by producers. Pethiyagoda went onto recall the recent Russian ban of Ceylon Tea perpetuated by a local ban on asbestos as another example of knee-jerk policy-making causing problems for the industry. “The ban on Russian chrysotile asbestos imports is another example. No one thought about the consequences to our tea exports to Russia, worth $150 million annually. And it wasn’t as if there was even a health risk. Even though we managed to get the ban lifted in just week, the damage to the international image of Ceylon tea was massive. We’re still fighting off the impression among consumers across the world that our tea has beetles in it. Our tea is the best in the world and will stay that way if only short-sighted politicians keep their hands off it,” he said. Meanwhile, the Spices and Allied Products Producers’ and Traders’ Association said it is “very happy” to learn of President Sirisena’s proposed ban to be effective from 10 February. “This step is in the right direction to protect Sri Lanka pepper,” the Association said in a statement.